Romance and danger in a world where demons inspire killers, and angels inspire forbidden lust. When Detective John Stonebrook’s friends hire a male stripper for his fortieth birthday party, his life takes a strange turn. For the stripper is Finn, a vibrant, headstrong Angel who has accidentally been bound as the Guardian Angel of a serial killer, possibly the same killer who murdered John’s wife and daughter. John is a man with a death wish. He’s also a man who believes he knows himself completely. But meeting Finn changes everything, because John begins to feel things for the red-haired stripper that he’s never felt for any man: dirty things. Romantic things. Impossible things. John doesn’t understand how a pretty young man can keep him awake at night, aching with forbidden lust, but there’s no denying that John can’t resist Finn even if Finn appears to be connected to death and danger. Finn isn’t supposed to be on Earth. His lover is elsewhere. Above. But when he meets Detective Stonebrook, Finn begins to believe that maybe he’s meant to be among humans after all. He tempts John and coaxes John, convinced he can help the detective by overcoming his inhibitions. But life as an Angel on Earth is difficult. Molested and harassed by Demons, Finn is on the verge of breaking. 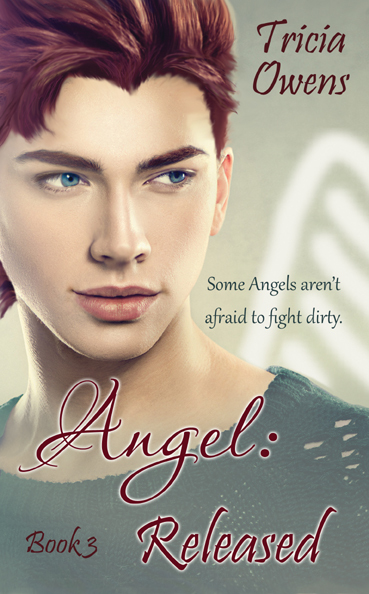 How long can a sole Angel hold out against the forces of evil? And is he wrong for tempting John with a desire the detective has never known? As John battles his unexpected feelings for this young and beautiful male, and as Finn struggles to protect a man who may be a murderer, they are hounded by creatures of the dark that seek to drag both Angel and detective down to the horror of the Beneath. Click here to get it for FREE! Detective John Stonebrook suspects there is something very strange about his attractive new friend, Finn, but he’s so infatuated with the mysterious young man that it’s difficult for him to think clearly. It’s a bad time to be distracted, because someone is sending John ominous messages that suggest Finn may be in danger… or may be the actual source of the danger. It’s the last thing John wants to deal with when he’s already troubled by his unexpected feelings of desire for Finn…after forty years of believing that he is straight. Falling in love with a man wasn’t supposed to happen to Detective John Stonebrook after two decades of marriage. Falling in love with a young man who is also is an Angel is just the icing on the very strange cake that is Finn. But Finn makes John happy, and the detective gives Finn hope that there might be a happy ending yet for him and Jeremy. But the Beneath isn’t content to allow the Angel and the detective to find their peace. When societal pressures and accusations at work threaten to drive them apart, and when the Angel Hunter pulls out his final ace in the hole, Finn and John find themselves fighting their greatest battle yet, against humans and Demons alike. 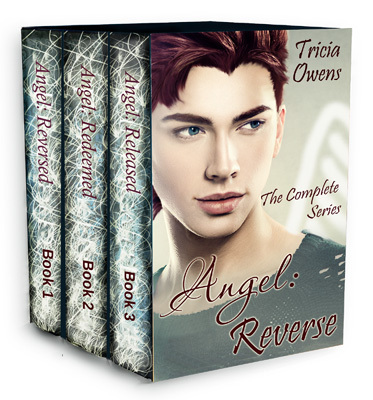 The complete Angel: Reverse series in one bundle! Ryan thought becoming an Angel would be easy. Well, besides the whole dying part. But earning his wings is difficult when he’s hounded by bouts of insecurity and a secret, unrequited love. The only good thing to happen to him is his friendship with the lovable Angel Finnian. But Finnian is lover to the Commander of Heaven’s Army: Anifiel, the most magnificent Angel in Heaven. Anifiel doesn’t approve of his lover befriending a measly human, and when Finnian’s curiosity about Earth compels him to leave Heaven to investigate it, Anifiel points to Ryan’s bad influence. Ryan doesn’t know how to appease this Alpha Angel when everything that Ryan does is deemed wrong in the great Angel’s eyes. It doesn’t help that every time Anifiel draws near, Ryan is overcome with a lust too powerful to resist, a lust that Anifiel resents. Can Ryan manage to behave long enough to find a way to bring Finnian back? Or is Ryan doomed to remain a human in Heaven, never quite good enough for anyone? How much knowledge is too much knowledge? While Ryan has made an enemy of the greatest Angel in Heaven–Anifiel, the Commander of Heaven’s Army–Ryan has also somehow managed to befriend Anifiel’s kind and gentle battle companion, Vithius. Ryan adores the handsome Angel and is all too happy to teach Vithius the ways that humans make love. But how much knowledge is too much? Is he corrupting Vithius as Anifiel has accused? Meanwhile, Demons are beating at the gates of Heaven with renewed aggression. Vithius believes he knows why the Demons are so determined, but Anifiel and Ryan refuse to listen to his theory, afraid to believe what it signifies about their relationship to each other. Can Vithius bring the three of them together? Or will the desire that they continue to resist bring down the entirety of Heaven?